In general, machining metal on a lathe or mill takes skill and patience as the accuracy of the cuts are important. To make those accurate cuts, it is important to know where the tool is located and how far it moves. For manual machines, the most basic method of determining position is by using graduated dials mounted on the hand cranks. Although these graduated dials can certainly be accurate, they may be difficult to see and they also require the operator to do math in their head on the fly with every full revolution of the dial. Another option would be a digital read out (DRO) which has an encoder mounted to the moving axes of the machine. 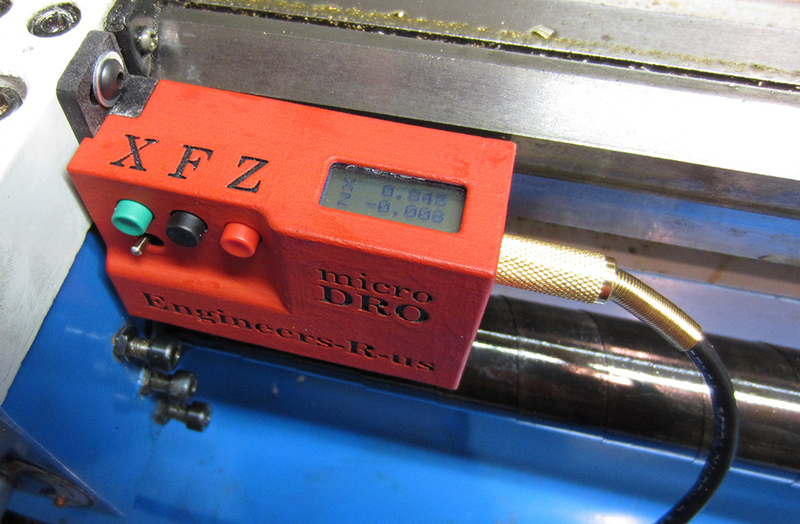 This setup displays the exact position of the tool on an easy to read numeric display. Professional DRO kits for mills and lathes can cost between a few hundred dollars to several thousand dollars. [Robert] has a lathe, wanted a DRO but didn’t want to shell out serious cash to get it. He built his own for super cheap in an extremely resourceful way…. using a Harbor Freight Digital Caliper. A housing was first fabricated so that the added equipment would not hinder the axis travel of the lathe. The caliper was then cut to length, installed in the housing and the entire assembly was then mounted to the lathe. It is totally reasonable to use the stock caliper display to read the positional information, however, even these cheap digital calipers have connections for the encoder output data, which can easily be read by a microcontroller. That means it is super simple to hook these low-cost digital calipers up to a display remotely located in a more convenient position. In the quest to add a digital readout to his mill, [Yuriy] has done a lot of homework. He’s sourced a trio of very capable scales, researched what kind of hardware his DRO should be based on, and even built a very cool display using seven-segment LEDs. After nearly a year of work, [Yuriy] finally hit upon something that works well: an Arduino and an Android tablet, perfectly matched for one of the prettiest machine shop displays we’ve ever seen. [Yuriy] based his build off a trio of digital scales he bought from Grizzly. These scales bolt on to the frame of his mill and send data to their own display. 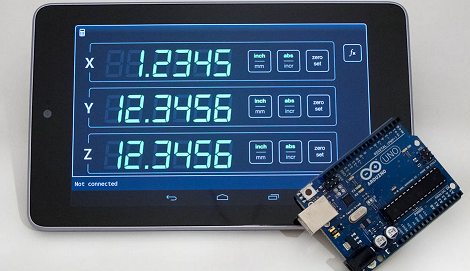 An Arduino was used to pull the data off these scales and sent via Bluetooth to a Nexus 7 Android tablet. Considering a DRO solely based on an Arduino and a character LCD would look a little chintzy – and the fact Arduinos can’t do floating point arithmetic – we’re really impressed with [Yuriy]’s very elegant solution. Thanks [Lee] for sending this one in.